Have you ever wondered what it would be like to stay after class one day and talk to your philosophy professor for hours and hours? I am sure it would be either fascinating or the dullest talk you have ever had. That’s what this movie is like, except it’s a great talk and not one to bore you out of your mind. This is a well written and acting piece with engaging dialogue. Let’s REEL-y break this down. *I am working on catchphrases for these reviews. Did that one work? No? Ok, scratch that one. Director James Ponsoldt, who also directed my favorite movie of 2013, The Spectacular Now, brings another intimate story following an author and a reporter doing a piece on him for The Rolling Stone magazine. 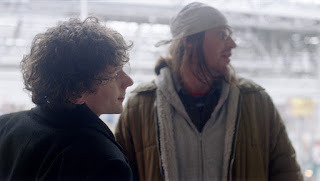 This film is dialogue heavy and it is all focused on the relationship between Jason Segal’s character, David Foster Wallace, and Jesse Eisenberg’s character, David Lipsky. Every piece of dialogue that comes out of Segal’s mouth is very intriguing and there is meaning to it and it wasn’t filler and pointless. What Ponsoldt does is create this quiet environment and have us really focus on these characters and study Wallace as a person. I have never heard of Wallace until this movie. Apparently, he was a well-known author and I didn’t know because I am dumb and I don’t know words. This character is also very depressing to watch. He is extremely smart; but there is something that is bothering him and I just wanted to go help him. It’s first and foremost and relationship movie and it captures that friendship perfectly. I don’t have much to say, but I kind of wished there was more development with Eisenberg. There were a few things we learned about him, buy I wanted more. He is the main character. If Ponsoldt would have focused a tad more on Eisenberg, it would have taken this to another level. Jason freaking Segal. This is his breakout role. Listen, Eisenberg is terrific in the film and brings a lot to the movie, but Segal steps out of his comedic box and tries a more reserved role and he kills it. We have seen Eisenberg in dramas, such as The Social Network, but this was Segal’s movie. The supporting cast was good, but it’s mainly focused on these two powerhouse actors. I don’t know if I am exaggerating but I think Segal and Eisenberg takes up 90 percent of the runtime alone. Like I stated up above, I wanted more to Eisenberg. I loved his performance and he had the emotional depth, but I wanted more character, as we only knew a small amount of him. It’s a beautiful movie which reflects on the beautiful friendship forming. It’s the type of cinematography that makes you feel warm. This maybe weird, but I really enjoyed the shots of the sun with the characters. To me, it showed us how enlightening and profound Wallace actually was. But then again, I have said some dumb things in my reviews before. This is an engaging, dialogue driven movie that will captivate you and make think about your life, as many questions are presented about your own. It deals with depression, loneliness, fame, being loved and a lot more. Everyone can relate to this to where it should very well. People that aren’t into movies where it’s all talk may think it’s boring and uninteresting. Overall: This is, simply, a humble movie about two guys questioning life and themselves and James Ponsoldt knocks it out of the park again. This is a great and competitive year for films and my top ten list is tight, but I think The End of the Tour will be on there.